how do we theorize and make media in a time of overabundance and in a place that is here, there, and everwhere? So much synchronicity you might say (as would all of the intrepid interviewees in Room 237) given that I was just this very morning talking to my daughter (while I was streaming the film … hmmm), who’s so fired up by her High School English class and English teacher. Although they’re stuck on sonnets, it’s no matter the form, she explains, if your teacher opens you up to formalism. “Did you learn that in college, too, Mommy?” Learn it in college! I teach it to this day: that the formal choices and structures of the artist are there to be read, and interpreted, and thought about and discussed, and even written about by an artist’s devoted, lively readers! “Sure it’s fun to read for plot,” I said to her, “but when your thought processes also get to work through, chew on, revel in the clever devices and lush symbols that hold that story itself, the pleasures multiply.” She agreed. What’s cool about my job, I then explained, is that I get paid to do that: read myself, live myself, be myself, in relation to great works by amazing artists that speak to me (that I speak to). Then I read what others say about that great artist. And even better yet, “I go to a classroom and speak about all this with smart kids, just a little older than you.” (You are getting the symbolism? mother/daughter … almost like twins, or palimsests … like in The Shining, or Room 237 where we actually get to watch what happens when you layer The Shining forward and backward upon itself as a visual reckoning of its conjectured formal mirrorings, repeatings, forward-and-backwarding motifs). 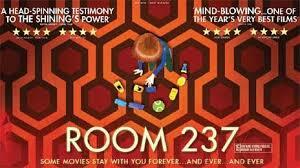 My dear friends, P. David Ebersole and Todd Hughes are Executive Producers of Room 237 (Rodney Ascher), and also play their own twinned parts in this tight, intense project that opens creepy, wonderful doors that should allow not just for ruminations on Kubrick—his intentions, his genius, his symbols—but for all of us (writing about movies on the Internet) to reflect upon our own creepy, wonderful critical projects about others’ art, thereby begging the same scary kinds of mirroring questions grappled with in and through Room 237, questions about when something good becomes its evil reverse: artist/critic, fan/art work, mother/house, obsessive-compulsive/close-reader, father/horror, conspiracy theorist/professor, lover/killer. 237‘s team, who themselves lovingly find and know every film reference (and more!) to perfectly illustrate their obsessed subjects’ visions of Kubrick are only different, I suppose, because, well, they made their own successful movie about and from it. At the DML Open Learning Conference yesterday (synchronicity? conspiracy? fun-house mirror? you tell me! ), I was talking with a gaggle of Internet scholars about how to transform the seas of fan culture online (be it remixing, shipping, fanfic) into that very same doorway—the gateway drug to blogging, art-making, criticism, professordum, and yes, sometimes redrum. Is there a difference in kind between my musings about a film or filmmaker (here, or in a book, or a classroom) and that of my daughter and her friends about Homestuck or Supernatural? Or is this only marked by degrees, pedigree, audience, form, format or training? And what are the conditions that reign some of us back: keeping us from devolving into conspiracy theorists or stalkers, our obsession producing an inward maze where at the end all we see are our own creepy visions? One of the film’s interviewees marks how Kubrick always gives some of his characters the skills to backtrack out of the ever-tightening loop; how he marks special doors that allow for escape out of his tightly-made forms (and the very “formalism” that draws us all into that shared reader/writer, child/maze project that is so deeply compelling). I, too, think that ultimately our forms (that we look at or speak through) are of less importance than are these exits (and to theorize, make, and practice exiting is perhaps even harder than to write the paths deep into the maze). The exit project maps the ways out to spaces for community, builds pathways to conversation and growing understanding, and takes time for these interactions (in class, online, via art) leading to the making of new forms of creativity that allow for other steps forward (while always looking back, to history, to art work, to each other), so as to together understand that the original form must be linked to and left by ourselves as sametime critics and producers of a culture that can sustain us. I begin my talk with this video about repurposing social media spaces, such as this one, for the specific purposes of multi-disciplinary and multi-modal teaching and learning, as well as for its scholarship by showing this video, so representing, in form, my feminist commitment to engage in self-reflexive, situated critiques of the Internet that model here the kind of culture I hope it to be, a place that enacts collaboration, connections between the classroom and the world, intentional and ethical links between and within real and virtual experiences and private and public knowledge, and a commitment to finding, teaching, and using the forms of literacy best suited for these places and practices. I self-reflexively argue above, here, and in the talk: engaged, situated pedagogy and research in the digital humanities demand new writing and speaking forms, as well as the presentational and publishing platforms to hold them. I’ve been asked to blog during the SCMS conference on their website. I think it may be closed to non-members, so here’s what I wrote there. The memorial event last night for Alex Doty was unlike anything I’ve ever attended at SCMS (or any other conference for that matter). Lovingly arranged and choreographed by this year’s Queer Caucus officers (Jen Malkowski, Patty Ahn and Julia Himberg) and as equally lovingly attended by a great many friends, colleagues, and fans of Doty, the affair was at once a vibrant, communal celebration of a particular man and scholar as well as serving as a reminder of the role of intellectual community, in this case the SCMS Queer Caucus (of which Doty was a founding member). Let me start with the man, and end with the caucus, a provocation (or two), and an invitation. There were six beautiful, careful presentations from the stage and a cocktail party after. In the first version of this post that just got eaten by my computer, I carefully detailed each one’s loving remarks and how they built the presence of a respected, treasured, seminal member of the SCMS community. From SCMS President, Chris Holmlund’s detailed tracing of the history of the Queer Caucus itself, exactingly drawn through a treasure trove of documents from the Society’s past (located by Michael Metzger), to Corey Creekmur’s evocation of Doty as “not a person but an event,” to Kara Keeling’s anecdote about reading Making Things Perfectly Queer as a grad student and learning there the “things I already knew but did not know why I knew these things,” or Taylor Cole Miller explaining how his teaching always accounts for a queering of popular culture, for all students and across creative exercises because of an approach he learned from Doty’s writing, or Sarah Sinwell’s reminder that so many in the room had used Doty’s quote about a “queer reading” not being “alternative, or wishful thinking, or reading into things too much.” The take away was both a brave, fun, dedicated intellectual, teacher and friend who had the courage to work with others to found a sub-field based upon how he lived in the world, and in the world of media, and also a tender community of people who know each other in a variety of ways: from conferences, caucuses, and lectures, to the many words we write and share over a career. And listening to the care by which these colleagues drew this man and his work, and seeing the care by which the organizers had produced the event, I saw that part of what the Queer Caucus (and Alex Doty, and so many more of us) have produced is the place for love, or respect, and the personal, within professional contexts: and this has always been at the heart of our theoretical and political project as feminists (and I’d warrant many of the other Caucuses share this project). The Alexander Doty Queer Mentoring Program of the Caucus is one example of this practice, as is Doty’s writing and teaching. And yet, as scholars, we so rarely publicly express the fondness, and other feelings, we have for our colleagues: how their work moves us. I thought to myself, I bet Alex didn’t know this—that we all knew him in one way or another, and respected him, and understood (or wanted to understand) his part in our own history as intellectuals and activists—because we so rarely tell each other: I used you in a paper, or I taught you in a class, or your words saved me. And then, I wondered, too, about those who didn’t know Alex, who weren’t at the memorial, and weren’t members of our Caucus, and didn’t read his books or attend his lectures … even once. Man did you miss something and someone! Sean Griffin said of Alex how he always managed to fashion both camaraderie and a diva moment, producing an “I’m fabulous and you are all going to come with me” sort of presence wherever he was at work. But if you didn’t track through SCMS seeing the faces I have come to know, again and again, given, as you might not be—queer—maybe you didn’t know this … So, I thought of the others Caucuses, and wondered if love and anger and pride was in their hearts and history, and if they might have an event like this someday, as sad as that may be. And that leads me to my provocation, and my title, which points to the centers of centers and the margins of margins in the making of fields and communities, and sub-fields and their communities. Are we queers central to this field? Do you know us and our work? Do I know your work and caucus? Let’s try to go to another sub-field’s meeting or panel at this conference, and meet the Alex Doty we wouldn’t necessarily circulate around by way of affinity. And what’s more, let’s tell a colleague or friend that their ideas move us, so that we can mark our love for what Griffin called “the concept” (our work) as well as the person, and so that the person can know we cherish their concepts while we are together still. 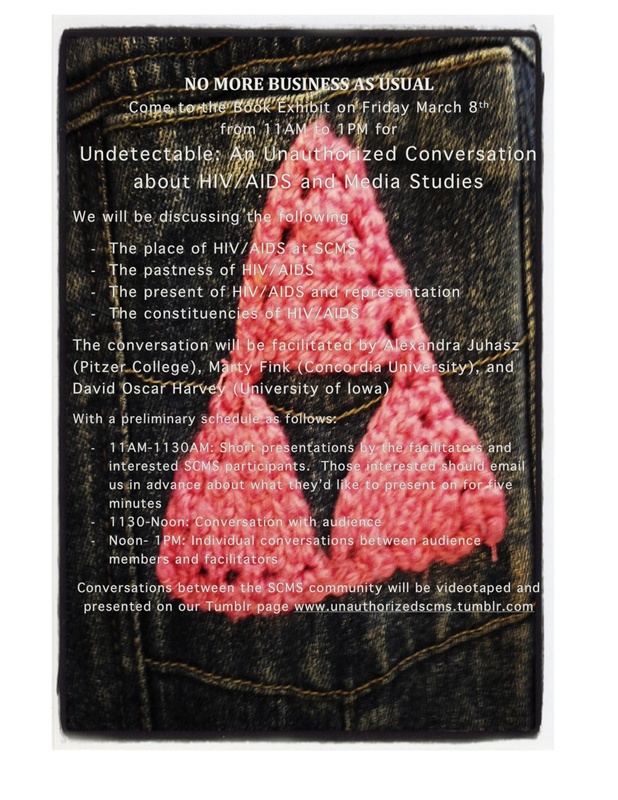 And finally, an invitation in kind: tomorrow, Friday, March 8, I will be participating in an “Unauthorized Conversation” about HIV/AIDS and Media Studies, in the Book Exhibit from 11-1. With my friends, colleagues, and AIDS comrades in arms, Marty Fink and David Oscar Harvey, we will engage in a conversation about many queer things, including some of the questions I asked above: about the history and politics of sub-field production and maintenance given the growth of the larger field. You don’t have to be queer to know about AIDS, or to care about its place in Media Studies. We’d love to have you as part of the conversation. Please come and participate if you will be at SCMS in March. We’d also greatly appreciate it if you pass on the word to those who might be interested. Since we’re not on the program, officially, your digital assistance is the only way we can let people know about our unofficial panel.